To standardise the internal instruction for staff officers the “LAZARUS UNION Leadership Academy“ was founded effect 1. December 2015. Task of this academy is to convey standardised “knowledge modules“ regarding the LAZARUS UNION to officers and high-ranking NCOs. It is not an academic study and do not have academic grades! 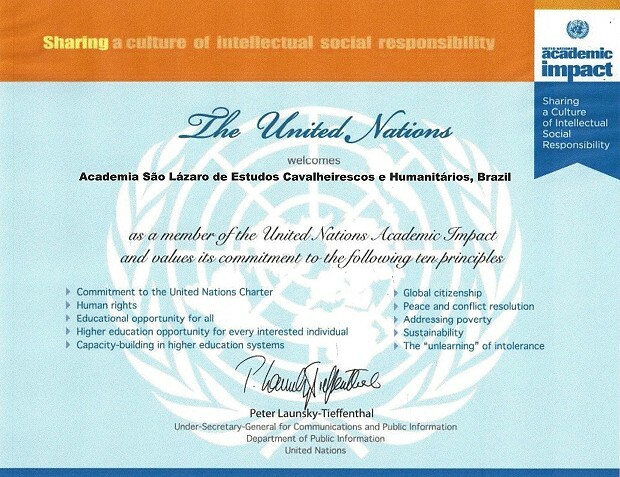 Our biggest group member, the CSLI Brazil, with its “Academia São Lázaro de Estudos Cavalheirescos e Humanitários (ASLECH)” is an accredited full member of UNAI (United Nation Academic Impact) and we have therefore agreed that our leadership academy within the LAZARUS UNION acts here in Austria as a branch. While the Leadership Academy is an independent unit, but under the umbrella of the CSLI Brazil respective of its ASLECH. So we can avoid for ourselves a long-standing certification process. Today I address you in my function as Union Commander and at the same time I appeal to your officer’s honour and your understanding! It has been pointed out to me from various sides and I have noted also myself that (unfortunately) only a few comrades of all the groups addressed are able to give competent and also correct information when asked about the Lazarus Union. First of all this is rather embarrassing and also does not cast a positive light on us at all. All documentation and information necessary can be found on our web site and in packed yet complete form in our new chronicles respectively by downloading our history pages from the web site. As I am responsible to the board and to the Lazarus Union for all promotions and also responsible for the knowledge and training of all officers I will with immediate effect not appoint anymore to any rank from CSLI Captain, CSLI NC Lieutenant Commander CSLI NC, CSLI Air Wing Senior Officer, and equal onwards if this (really necessary) basic knowhow is not present and verified. Officers of these levels are commanders and also act as a role model and as such must possess the necessary knowledge and with staff officers this should be self-evident. On one hand nobody is forced to become a Lazarus Union officer but on the other hand nobody should expect the Lazarus Union to appoint officers without appropriate qualification. The responsible commanders are therefore requested to ensure that the corresponding modules have been successfully completed before submission or submission of an officer’s rank or promotion. Without a positive test result the highest rank appointed currently is First Lieutenant (or similar). Please choose the language you want to take the Test “Quiz”! Passed Tests (“Quizzes”) will be shown in Certificates. “My achievements” is not available now; will be used for further development.